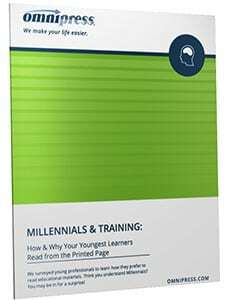 Read The Results Of This Independent Survey To Learn Which Types Of Training Materials Millennials Prefer. Today, one in three Americans in the workforce is a Millennial. Having never known a world without the internet, it was assumed they would prefer—even demand—digital distribution of continuing education materials. We conducted a survey to ask them which formats they prefer when learning complex topics. Which materials Millennials prefer for learning new concepts. How Millennials predict they will learn in the future. Which formats Millennials find most reliable for reference materials. What role podcasts have in continuing education materials for Millennials.